My snowmen are STILL standing in the front yard! While we've been home, I've stayed pretty busy with the boys. We watched a lot of movies together, played some checkers - just had fun! I did spend a little time in my scrap area though. I am trying to finish off my supply of Basic Grey's "Eerie" line. Here I paired it up with some old Scenic Route (arrows). I thought my title "Trick ARRRR Treat" was appropriate for these Halloween photos of Pirate Blake from '05. Gosh, he's grown! 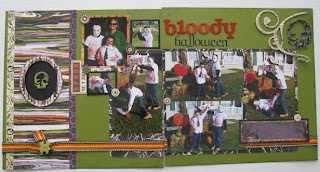 I also scrapped a LO for Blake's album using family shots from this past Halloween. For Blake, I also scrapped shots of the boys at home before we left to go trick or treating. I was inspired by a LO on Alison Davis' blog. 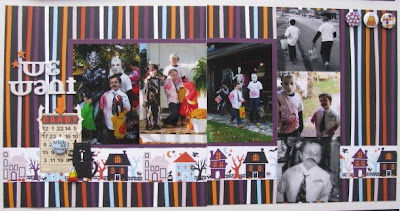 "We want Candy" was inspired by a sketch posted by Lisa Hidy on her blog. It was a single page sketch, but I stretched it out into a 2-pager and used American Crafts products. 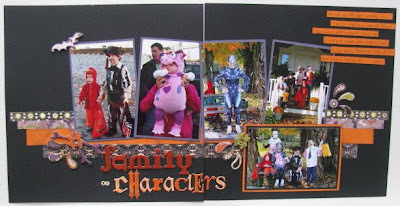 I continued using the American Crafts products on Kevin's layout showcasing the family costumes on Halloween. That's my next-to-youngest sister Kaitlin in the center dressed at Tranformer's Megatron. She's 21! 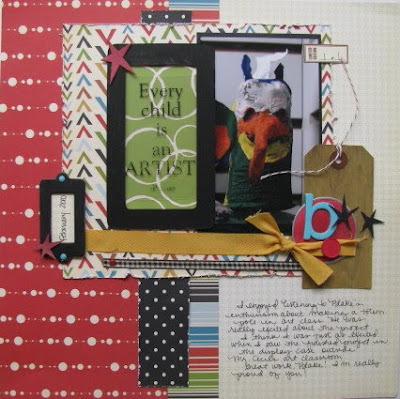 Today I scraplifted a LO by Roree Rumph in the February issue of Scrapbook Trends magazine. I used some Scenic Route Cape Town papers that a friend sent me. Scenic Route never goes out of style. (Have I mentioned how much I'll miss them?!?) I got crafty with my paints and glimmer mists. The tag was a BRIGHT yellow, but I used Tattered Leather glimmer mist. It was too dark, so I wiped it off and it left a wood-grain look. I thought it was pretty cool ;) The red in the chipboard stars and on the tag was from Candy Apple Red Glimmer Mist. I now have more colors on my wish list! 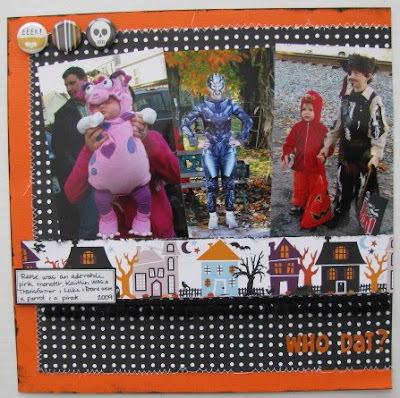 I have one more Halloween layout to share, but I scrapped it with Valentine's Day products since Reese, my niece, was a too cute pink monster. I was actually able to visit with Reese twice over the past week. She's really grown since October, hasn't she? She's a mess! Now, I'm trying to work in some crop time. Personal Scrapper is having a mini online crop that started last night. I'm actually hoping we are back to school tomorrow! I think the boys are ready for it, too. 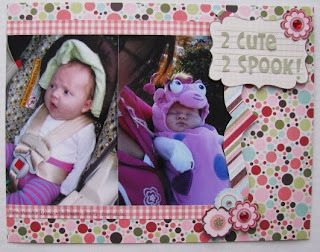 Love your scraplift Amy! I agree about missing Scenic Route - they're a favorite. Thanks for sharing! More great layouts Amy, thanks for using my sketch, I LOVE how you turned it into a 2 pager! Can't wait to see what you do with the rest of the challenges! Great pages, Amy! Love seeing how you incorporated the SR papers. I can't believe how big Reese is getting!